Kenneth Anthony Abraham was born circa 1924 at North Dakota. Kenneth Anthony Abraham died before October 2001. Kenneth Anthony Abraham lived in 1964 at Portland, Oregon. Name Variation Gerald Olaf Abraham was also known as Jerry. Gerald Olaf Abraham was born on 5 April 1937. Gerald Olaf Abraham died on 29 September 2001 at age 64 Service for Gerald "Jerry'' Abraham, 64, will be at 10 a.m. Thursday at Sherman-Knapp Funeral Home in Priest River. Mr. Abraham, who was born in Beach, N.D., died Saturday. He was a resident of Priest River for 22 years. He graduated from Beach High School in 1956 and later served in the Army. Mr. Abraham worked in a plywood mill in Portland before moving to Brush Prairie, Wash. While there he owned and operated several businesses, including a meat market and a restaurant and lounge. In 1979, he moved to Priest River, where he owned and operated the Logger's Bar. He married Norma Lee Mitchell in Coeur d'Alene in 1983. Mr. Abraham was a member of the Veterans of Foreign Wars and the Eagles. Survivors include his wife; a daughter, Sandy Ouellette of Colton, Ore; two sons, Lloyd Abraham of Mulino, Ore., and Butch Abraham of Molalla, Ore; three stepsons, Chip Green of Tucson, Ariz., Mike Green of Roseville, Calif., and Steve Green of Priest River; a sister, Betty Lou Petersen of Bowman, N.D; four grandchildren and three great-grandchildren. Published on 10/3/2001. Gerald Olaf Abraham obtained US Social Security Card at North Dakota; last residence Priest River, Bonner, Idaho. Duane Oliver Abraham was born on 4 March 1939. Duane Oliver Abraham died on 6 November 1997 at age 58. Duane Oliver Abraham obtained US Social Security Card at North Dakota; last residence Battle Ground, Clark, Washington. He lived in 1964 at Wibaux, Montana. Married Name 19 September 1925 As of 19 September 1925,her married name was Abraham. She was the daughter of Charles Horsman and Phebe Corey. Bea J. Horsman married Arvid Albin Abraham, son of Sever Abraham and Anna Olina Christensen, on 19 September 1925 at Congregational, Manse, Glendive, Montana. Bea J. Horsman died on 7 December 1986 at age 82. Bea J. Horsman obtained US Social Security Card at North Dakota; last residence Beach, Golden Valley, North Dakota. [S9] South Dakota, South Dakota Birth Records South Dakota, State File Number: 665831 (unknown file date). Name Variation Mary Jane Abraham was also known as MJ. Married Name 10 February 1954 As of 10 February 1954,her married name was Phillips. Married Name 5 January 1980 As of 5 January 1980,her married name was Setterlund. Mary Jane Abraham was born on 22 February 1928 at Beach, Golden Valey, North Dakota. She was the daughter of Arvid Albin Abraham and Bea J. Horsman. Mary Jane Abraham married Phillip Earnest Setterlund on 5 January 1980 at Reno, Nevada. Mary Jane Abraham died on 21 March 2007 at Multnomah, Oregon, at age 79. Mary Jane Abraham obtained US Social Security Card at North Dakota; last residence Troutdale, Multnomah, Oregon. Married Name 7 July 1922 As of 7 July 1922,her married name was Abraham. Marie Louise Helm was born on 29 October 1904 at Portland, Oregon. She was the daughter of Andrew Helm and Lydia Geyer. Marie Louise Helm married Selmar Abraham, son of Sever Abraham and Anna Olina Christensen, on 7 July 1922 at Wibaux, Montana. Marie Louise Helm died on 4 November 1989 at age 85. Marie Louise Helm obtained US Social Security Card at Washington; last residence East Wenatchee, Douglas, Washington. [S243] U.S. Federal Census 1920 U.S. Federal Census, by Ancestry.com, ED61. Dwelling 33. Andrew Helm was born circa 1881 at Russia. He married Lydia Geyer, daughter of Henry Geyer, circa 1891. Andrew Helm died after April 1930. [S250] U.S. Federal Census 1930 U.S. Federal Census, by Ancestry.com, ED17-1. Dwelling 232. Orve Earl Abraham was born on 29 April 1924 at Portland, Oregon. He was the son of Selmar Abraham and Marie Louise Helm. Orve Earl Abraham died on 17 August 2003 at age 79. Orve Earl Abraham obtained US Social Security Card at Washington; last residence Cordova, Walker, Alabama. On 5 June 1959 at Letter from his father, Selmar., [Orve] enlisted in the Sea Bees branch of the Navy in 1942, mustered out in March of 1946. Is a chef by trade, is married, no children. Present address, Point Verdra, Florida. He and Pat work in the Inn at this Golf resort. Darryl Boyd Abraham was born on 13 May 1936 at near Spink, Union, South Dakota. 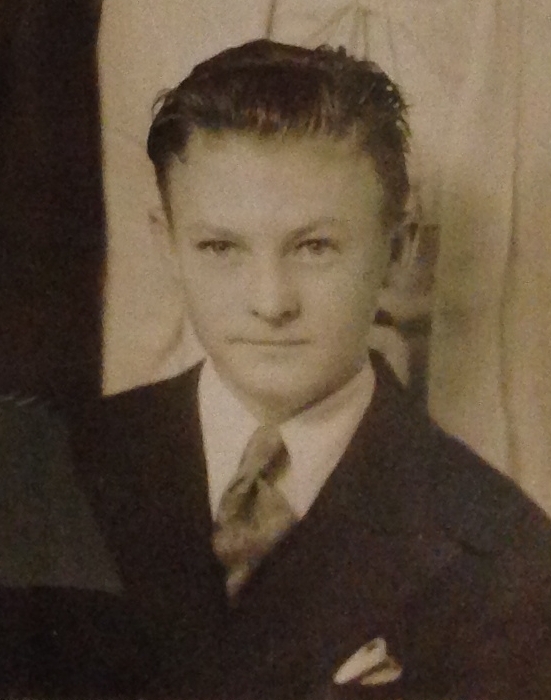 Darryl Boyd Abraham was baptized on 14 June 1936 at Brule Creek Lutheran Church, Union, South Dakota. He died on 9 February 2001 at age 64. Darryl Boyd Abraham obtained US Social Security Card at Washington; last residence Everett, Snohomish, Washington. Married Name 3 July 1930 As of 3 July 1930,her married name was Abraham. Ruth Isabelle Golliet was born on 16 December 1908 at Gardner, Cass, North Dakota. Ruth Isabelle Golliet married Andrew Julius Abraham, son of Sever Abraham and Anna Olina Christensen, on 3 July 1930. Ruth Isabelle Golliet died on 2 February 1992 at Multnomah, Oregon, at age 83. 1925 Beach, Golden Valley, North Dakota Ruth Isabelle Golliet appeared on the census of 1925 in the household of Peter Golliet at Beach, Golden Valley, North Dakota. Ruth Isabelle Golliet obtained US Social Security Card at Washington; last residence not specified. Name Variation Clara Celia Raisler was also known as Clara Cecilia. Married Name 14 July 1939 As of 14 July 1939,her married name was Abraham. Clara Celia Raisler was born on 6 October 1902 at Illinois. Clara Celia Raisler married Elmer Abraham, son of Sever Abraham and Anna Olina Christensen, on 14 July 1939 at Golden Dale, Washington. Clara Celia Raisler died on 18 October 1991 at age 89. Clara Celia Raisler obtained US Social Security Card at North Dakota; last residence not specified. Jesse Eugene Houck was born on 14 February 1894 at Eleva, Trempealeau, Wisconsin, also reported as 16 Feb 1894 and 15 Feb 1894. He was the son of William A. Houck and Bertha M. Thom. Jesse Eugene Houck married Lizzie Ingaborg Abraham, daughter of Sever Abraham and Anna Olina Christensen, on 18 November 1922 at Glendive, Dawson, Montana. Jesse Eugene Houck died on 25 June 1966 at Beach, Golden Valley, North Dakota, at age 72. He was buried after 25 June 1966 at Beach, Golden Valley, North Dakota. Comment: enlisted in Company M, 2nd Infantry, North Dakota National Guard, at Beach, on June 29, 1917; called into federal service, World War, on July 15, 1917; served in Company M, 2nd Infantry, North Dakota National Guard, to Oct. 5, 1917; Ambulance Company No. 164, 116th Sanitary Train, to April 25, 1918; Ambulance Company No. 161, to discharge. Grades: Corporal, Jan. 18, 1918; Sergeant, Nov. 24, 1918; overseas from Dec. 11, 1917, to May 9, 1919. Engagements: Offensive: Meuse-Argonne. Defensive Sectors: Anould (Alsace); St. Die (Lorraine). Discharged at Camp Dodge, Iowa, on May 22, 1919, as a Sergeant. On 5 June 1917 at World War I Draft Registration, Golden Valley, North Dakota. [S245] U.S. Federal Census 1900 U.S. Federal Census, by Ancestry.com, ED14. Dwelling 56. [S244] U.S. Federal Census 1910 U.S. Federal Census, by Ancestry.com, ED10. Dwelling 210. William Jesse Houck was born on 13 June 1923 at North Dakota. He was the son of Jesse Eugene Houck and Lizzie Ingaborg Abraham. William Jesse Houck died on 18 June 1949 at Minnesota at age 26. Name Variation Sigurd Pedersen was also known as Sig. Sigurd Pedersen was born on 14 October 1900 at Norway. He married Ollie Oline Abraham, daughter of Sever Abraham and Anna Olina Christensen, on 20 January 1926 at Glendive, Dawson, Montana. Sigurd Pedersen died on 28 March 1968 at Glendive, Dawson, Montana, at age 67. Sigurd Pedersen obtained US Social Security Card at Montana; last residence Wibaux, Wibaux, Montana. [S250] U.S. Federal Census 1930 U.S. Federal Census, by Ancestry.com, ED11-3. Dwelling 412. Bertha Ann Pedersen was born on 27 May 1926 at Setinel Butte, North Dakota. She was the daughter of Sigurd Pedersen and Ollie Oline Abraham. Bertha Ann Pedersen died on 29 May 1928 at age 2. Clarence Sidney Pedersen was born on 20 June 1927 at North Dakota. He was the son of Sigurd Pedersen and Ollie Oline Abraham. Clarence Sidney Pedersen died on 20 December 1989 at Wibaux, Montana, at age 62. Clarence Sidney Pedersen obtained US Social Security Card at Montana; last residence not specified. Married Name 27 June 1942 As of 27 June 1942,her married name was Abraham. Billie S. Ericksen was born on 28 December 1919 at Milltown, Skagit, Washington. She married Joseph Christopher Abraham, son of Sever Abraham and Anna Olina Christensen, on 27 June 1942 at East Stanwood, Snohomish, Washington. John Larson was born on 27 July 1843 at Vardal, Norway. He married Ingeborg Andersdatter Linaas, daughter of Anders Torgiusen Linaas and Hustru Ingeborg Andersdatter, in 1869 at Wisconsin. John Larson died after June 1900. [S246] U.S. Federal Census 1880 U.S. Federal Census, by Ancestry.com, ED5. Dwelling 61. Family History Library Film 1254115. Sheet 406C. [S393] Brule Creek Lutheran Church, 100th Anniversary of Brule Creek Lutheran Church, page 9. [S241] Historical Atlas of Dakota, online. Name Variation Ingeborg Andersdatter Linaas was also known as Ingbor. Married Name 1869 As of 1869,her married name was Larson. Ingeborg Andersdatter Linaas was born on 11 August 1844 at Norway. She was the daughter of Anders Torgiusen Linaas and Hustru Ingeborg Andersdatter. Ingeborg Andersdatter Linaas married John Larson in 1869 at Wisconsin. Ingeborg Andersdatter Linaas died on 8 August 1900 at Union, South Dakota, at age 55. Ingeborg Andersdatter Linaas immigrated in 1848. She had 7 with 6 living in 1900 children. 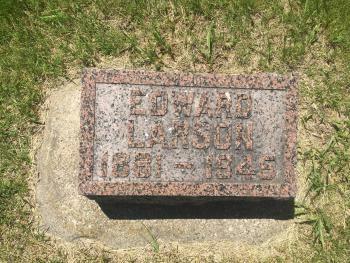 Name Variation Edward Martin Larson was also known as Eddie. Edward Martin Larson was born on 5 December 1880 at South Dakota also reported as 1881. He was the son of John Larson and Ingeborg Andersdatter Linaas. Edward Martin Larson married Esther O. Peterson, daughter of John M. Peterson and Mary C. Sellberg, on 29 May 1907 at Pierre, Hughes, South Dakota, Double wedding with Andreas Abrahamson & Lise Larson (Edward's sister). Edward Martin Larson died on 23 November 1945 at Union, South Dakota, at age 64. He was buried after 23 November 1945 at Brule Creek Cemetery, Spink, Union, South Dakota. [S244] U.S. Federal Census 1910 U.S. Federal Census, by Ancestry.com, ED127. Dwelling 78. Sheet 3B. [S243] U.S. Federal Census 1920 U.S. Federal Census, by Ancestry.com, Year: 1920;Census Place: Philip, Haakon, South Dakota; Roll: T625_1720; Page: 4A; Enumeration District: 83; Image: 714. [S250] U.S. Federal Census 1930 U.S. Federal Census, by Ancestry.com, ED21. Page 1B. Married Name 29 May 1907 As of 29 May 1907,her married name was Larson. She was the daughter of John M. Peterson and Mary C. Sellberg. Esther O. Peterson married Edward Martin Larson, son of John Larson and Ingeborg Andersdatter Linaas, on 29 May 1907 at Pierre, Hughes, South Dakota, Double wedding with Andreas Abrahamson & Lise Larson (Edward's sister). [S9] South Dakota, South Dakota Birth Records South Dakota, File Date: June 30, 1942 (unknown file date). [S245] U.S. Federal Census 1900 U.S. Federal Census, by Ancestry.com, ED339. Dwelling 45. Byron D. Blackstone married Charlene Alvina Abrahamson, daughter of Andreas 'Andy' Abrahamson and Leise Oline Larson, on 27 January 1955 at Sioux City, Iowa. Byron D. Blackstone died on 9 December 1982. Earl Turner was born on 5 May 1915 at Nebraska. He was the son of Edgar V. Turner and Eva Fowler. Earl Turner married Dorothy Evelyn Abrahamson, daughter of Andreas 'Andy' Abrahamson and Leise Oline Larson, before December 1935 1st marriage for Dorothy. Earl Turner died on 24 December 1935 at Yankton, South Dakota, at age 20. [S243] U.S. Federal Census 1920 U.S. Federal Census, by Ancestry.com, Year: 1920;Census Place: Meckling, Clay, South Dakota; Roll: T625_1716; Page: 2A; Enumeration District: 59; Image: 734. [S250] U.S. Federal Census 1930 U.S. Federal Census, by Ancestry.com, Year: 1930; Census Place: Meckling, Clay, South Dakota; Roll: 2220; Page: 1A; Enumeration District: 6; Image: 591.0. Name Variation James Robinson was also known as Red. James Robinson married Dorothy Evelyn Abrahamson, daughter of Andreas 'Andy' Abrahamson and Leise Oline Larson, before 1998 2nd marriage for Dorothy. Name Variation Leo Alverne Abrahamson was also known as Abraham. Leo Alverne Abrahamson was born on 5 July 1921 at Spink, Union, South Dakota. Leo Alverne Abrahamson was baptized on 24 July 1921 at Brule Creek Lutheran Church, Union, South Dakota. He married Lenora Vivian Jacobson, daughter of Richard Ossian Jacobson and Vivian Cornelia Johnson, on 8 December 1951 at East Side Lutheran Church, Sioux Falls, Minnehaha, South Dakota. Leo Alverne Abrahamson died on 2 November 2009 at Sioux Falls, South Dakota, at age 88 Leo Alverne Abrahamson, age 88, died on Monday, November 2, 2009 at Avera Heart Hospital in Sioux Falls. Leo Alverne Abrahamson was born on July 5, 1921 in Spink, SD to Andreas and Lisa (Larson) Abrahamson. He received his education in Elk Point, SD graduating from Elk Point High School in 1940. Leo enlisted into the United States Navy in 1942 and served our country until being honorably discharged in 1945. On December 8, 1951 Leo was united in marriage with Lenora Jacobson in Sioux Falls, SD. The couple made their home in Sioux Falls moving here in 1958. He worked as a mail carrier for the US Postal service for over 20 years retiring in 1981. Leo was a “Mr. Fix It” he built his own home, enjoyed maintaining his acreage, and enjoyed taking long walks around the mall. Grateful for having shared his life are his three daughters, Ruth Mayer of Canton, SD, Susan Abrahamson and her husband, Gary Watson of Albuquerque, NM, and Ann Abrahamson and her husband Jeff Andersen of Fort Collins, CO; five grandchildren, Justin (Desirae) Mayer, Wesley Mayer, Vicky (John) Heflin, Nicholas and Christopher Andersen; and one sister, Dorothy Robinson of Elk Point, SD. Leo is preceded in death by his parents; wife, Lenora in 2000; three brothers, Norman, Lewis and Philip; and one sister, Charlene Blackstone. 1945 South Dakota State Census, Spink, Union, South Dakota Leo Alverne Abrahamson appeared on the census of 1945 at South Dakota State Census, Spink, Union, South Dakota. Leo Alverne Abrahamson was a mailman. He was confirmed on 31 May 1936 at Brule Creek Church, Union, South Dakota. He and Lenora Vivian Jacobson lived in 1990 at 712 Splitrock Blvd., Brandon, South Dakota. Leo Alverne Abrahamson lived in January 2008 at 712 S Splitrock Blvd, Brandon, Minnehaha, South Dakota. Name Variation Philip Raymond Abrahamson was also known as Abraham. Philip Raymond Abrahamson was born on 28 November 1923 at Spink, Union, South Dakota. Philip Raymond Abrahamson was baptized on 9 March 1924 at Brule Creek Lutheran Church, Union, South Dakota. He died on 1 March 1993 at age 69 Philip Raymond Abrahamson, 69, Sioux Falls, died March 1, 1993. 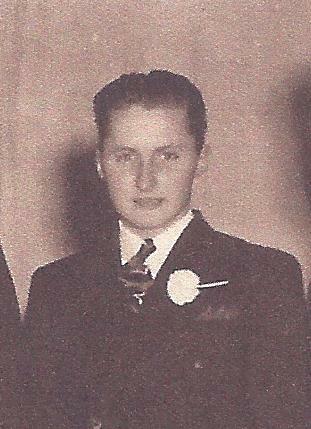 Philip, son of Lise O. Larson Abrahamson and Andreas A. Abrahamson, was born Nov. 28, 1923, at Spink. He grew up at Spink and attended country school before graduating from the University High School at Vermillion. Phil also attended Augustana College and graduated from Nettleton Business College. He served in the U.S. Navy as a Fireman 1st Class during WWII from May 23, 1973, until Feb. 19, 1946. He was united in marriage with V. Julia Van Dam on Jan. 11, 1949, at St. Joseph Cathedral in Sioux Falls. After their marriage the couple made their home in Sioux Falls. Phil and Julie were greatly blessed and fulfilled in their marriage through the adoption of the three children, Mary, Gary and Greg. Phil worked at Maxwell Hotel Supply for 42 years, retiring in 1989. He was a charter member of St. Lambert's Catholic Church, a member of the Marquette Council #815, 3rd Degree Knights of Columbus, John M. Bliss V.F.W. Post 628, the Elks, a former member of American Legion Post #15 and also coached his son's Hilltop Softball teams for 15 years. Grateful for having shared his life are his wife, Julie, Sioux Falls; his daughter, Mary Burbank and her husband, Chris, Minneapolis, Minn; two sons, Gary and his wife, Lynn, Aurora, Colo; and Greg and his wife, Lisa, Cedar Rapids, Iowa; five grandchildren; three brothers: Norman, Spink; Lewis, Sacramento, Calif; and Leo, Brandon; two sisters, Charlene Blackstone and Dorothy Robinson, both of Sioux City, Iowa; and a host of other relatives and friends. He was preceded in death his parents; one brother, John; and one sister, Ruth. Scripture service was held Thursday, March 4, 1993, at St. Lambert's Catholic Church, Sioux Falls, followed by a joint Knights of Columbus and Catholic Daughter's Rosary. Mass of Christian Burial was held March 5 at St. Lambert's, with Rev. Ed Pierce and Rev. Richard Baumberger, Concelebrants. Honorary pallbearers were Y.Z. Larson, Pat Ryan, Paul Dem.. Ament, Tony Weigel and Lowell Wetrosky. Active pallbearers were Paul Gannon, Rodney Gannon, Mark Nelson, Keith Abraham, March Van Dam and Tim Nelson. Interment was in St. Mary's Cemetery, Dell Rapids, with George Boom Funeral Home in charge of arrangements. 1945 South Dakota State Census, Spink, Union, South Dakota Philip Raymond Abrahamson appeared on the census of 1945 at South Dakota State Census, Spink, Union, South Dakota. Philip Raymond Abrahamson was a salesman. He obtained US Social Security Card at South Dakota; last residence Sioux Falls, Minnehaha, South Dakota. He lived in 1990 at Maxwell Hotel Sup, Sioux Falls, Minnehaha, South Dakota. Name Variation Ella Wilhelmina Meta Klemme was also known as Ella Minnie. Married Name 16 February 1938 As of 16 February 1938,her married name was Willer. Ella Wilhelmina Meta Klemme was born on 15 March 1913 at Akron, Plymouth, Iowa. She was the daughter of Henry August Klemme and Anna Sophia Schmidt. Ella Wilhelmina Meta Klemme married George A. Willer on 16 February 1938 at Marcus, Iowa, Double marriage of sisters Lenora and Ella Klemme with Mahlon Hansen and George Willer. Ella Wilhelmina Meta Klemme died on 18 August 2000 at Akron, Plymouth, Iowa, at age 87. 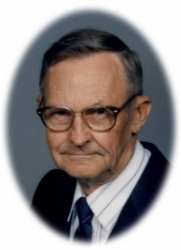 Embert August Folkert Klemme was born on 15 May 1915 at Akron, Iowa. He was the son of Henry August Klemme and Anna Sophia Schmidt. Embert August Folkert Klemme was a groomsman at the wedding of George A. Willer and Ella Wilhelmina Meta Klemme on 16 February 1938 at Marcus, Iowa; Double marriage of sisters Lenora and Ella Klemme with Mahlon Hansen and George Willer. Embert August Folkert Klemme married Helen Evelyn Sprenger, daughter of Louis Sprenger and Florence Waterbury, on 10 December 1941 at Nebraska. Embert August Folkert Klemme died on 26 February 1996 at age 80 Embert August Klemme, 80; of rural Akron, died unexpectedly Monday, Feb. 26, 1996, at his, home. Mr. Klemme was born May 15, 1915, on a farm near Ruble, the son of Harry A. and Anna (Schmidt). Klemme. He married Helen, E., Sprenger Dec. 10, 1941, at Dakota City. He farmed in the Ruble and Craig areas from 1943 to 1953 and the Akron area from 1953 until his retirement in 1991. Mr. Klemme was a member of the First Baptist Church of Akron. Neb., and Ronnie and Kathleen of Arizona; a daughter and her husband, Debbie Lewison and Kevin of Akron; 15 grandchildren; two great-grand- children; and a sister Mrs. George (Ella) Willer of Akron. He was preceded in death by two sisters, Mrs. Lenora Hanson Dirks and Mrs. Ted (Wilma) Willer; and a brother, Vernon H. Klemme. Services will be 10:30 a.m. Thursday at the First Baptist Church of Akron with the Rev. Fred Penner officiating. (Wednesday), with the family present From 7 to 8 p.m. at the Schroeder Home in Akron. Le Mars Daily Sentinel Wednesday, February 28, 1996. 1945 South Dakota State Census, Sioux Valley, Union, South Dakota Embert August Folkert Klemme appeared on the census of 1945 at South Dakota State Census, Sioux Valley, Union, South Dakota. Embert August Folkert Klemme obtained US Social Security Card at Iowa; last residence Akron, Plymouth, Iowa. He obtained US Social Security Card at Iowa; last residence Akron, Plymouth, Iowa. On 28 July 1957 at Akron, Plymouth, Iowa, attended Klemme Picnic family reunion. On 8 July 1962 at Akron, Iowa, Klemme Reunion 08 July 1962. On 18 January 1975 Harry Klemme 87th birthday celebration. Name Variation Lenora Anna Mathilda Klemme was also known as Nora. Married Name 16 February 1938 As of 16 February 1938,her married name was Hansen. Married Name before 1975 As of before 1975,her married name was Dirks. Lenora Anna Mathilda Klemme was born on 23 January 1917 at Akron, Iowa. Lenora Anna Mathilda Klemme married Mahlon D. Hansen on 16 February 1938 at Marcus, Iowa, Double marriage of sisters Lenora and Ella Klemme with Mahlon Hansen and George Willer. Lenora Anna Mathilda Klemme married (?) Dirks before 1975. Lenora Anna Mathilda Klemme died in 1987. Name Variation Wilma Erma Laverna Klemme was also known as Velma. Name Variation Wilma Erma Laverna Klemme was also known as Willma. Married Name 10 October 1945 As of 10 October 1945,her married name was Willer. Wilma Erma Laverna Klemme was born on 18 November 1919 at Akron, Iowa. Wilma Erma Laverna Klemme was a bridesmaid at the wedding of Mahlon D. Hansen and Lenora Anna Mathilda Klemme on 16 February 1938 at Marcus, Iowa; Double marriage of sisters Lenora and Ella Klemme with Mahlon Hansen and George Willer. Wilma Erma Laverna Klemme married Theodore William Willer on 10 October 1945. Wilma Erma Laverna Klemme died on 19 July 1993 at age 73.